There is a shock of recognition almost from the beginning of “Tex”, because we're listening to the sound of American voices in an authentically American world, the world of teenage boys trying to figure things out and make the right decisions. The voices sound right but may be a little unfamiliar, because adolescents on television are often made to talk in pseudo-hip sitcom nonspeak. Here in “Tex” are the clear voices of two young men who are worthy of attention. Their names are Tex and Mason. They're brothers, one about eighteen, the other fourteen and a half. They live by themselves in a rundown house on some land outside a rural suburb of Tulsa. Their father is a rodeo cowboy who hardly ever stops in at home and forgets to send money for weeks at a time. These two kids are raising themselves and doing a pretty good job of it. The movie tells the story of a couple of weeks in their lives. These are the kinds of weeks when things can go either well or badly--and if they go badly, we sense, Tex could get his whole life off to the wrong start. The brothers are broke. Mason sells their horses to raise money to buy food and get the gas turned back on. That makes Tex angry and sad; he's a kid looking for trouble. We meet the other people in their world. There's the rich family down the road, dominated by a stern father who makes his teenagers toe a strict line. His kids are just as unpredictable as anyone else's, but he doesn't believe that. He believes their two undisciplined friends, Tex and Mason, are leading them into trouble and practically dragging them to late-night beer parties. There's another complication. His daughter and Tex are beginning to fall in love. There's another friend, a local kid who got a girl pregnant, married her, and moved to Tulsa to start a family. He's dealing drugs. Mason knows this intuitively and surely, and knows the kid is heading for trouble. Tex knows it, too, but there comes a time in this story when Tex just doesn't give a damn, and when the drug dealer happens to be there, Tex accepts a ride into Tulsa with him. Tex doesn't do drugs himself, but he gets into a very scary situation with another dealer, and there's a harrowing scene in which Tex wavers just at the brink of getting into serious trouble. There is more to this movie's story, but the important thing about it isn't what happens, but how it happens. The movie is so accurately acted, especially by Jim Metzler as Mason and Matt Dillon as Tex, that we care more about the characters than about the plot. We can see them learning and growing, and when they have a heart-to-heart talk about "going all the way," we hear authentic teenagers speaking, not kids who seem to have been raised at Beverly Hills cocktail parties. 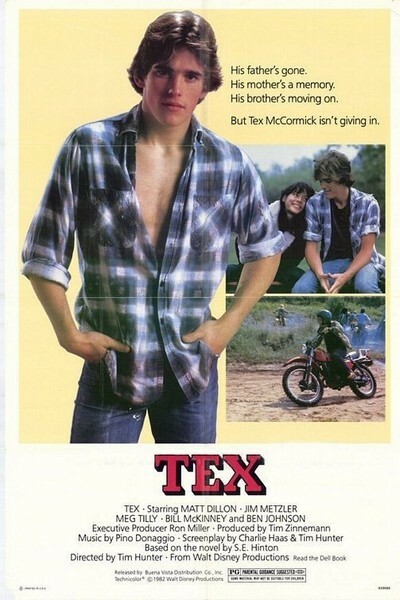 “Tex” is based on a famous novel by S.E. Hinton, who has had two of her other novels filmed by Francis Ford Coppola. She knows a great deal about adolescents, and her work is unaffected by sentimentality and easy romance. It's authentic. But the backgrounds of the two filmmakers are also interesting. Tim Hunter and Charles Haas bought the book and wrote the screenplay, and Hunter directed. Their previous collaboration was a little movie named OVER THE EDGE, about teenagers who feel cornered and persecuted by the rigid middle-class rules of a cardboard Denver suburb. That movie, a small masterpiece containing Matt Dillon's first movie appearance, never got a fair chance in theaters. Now here are Hunter and Haas again, still remembering what it's like to be young, still getting the dialogue and the attitudes, the hang-ups and the dreams, exactly right.